Do you have a broken television and no means to purchase a new set or bring your TV to a repair shop? At Affordable In-Home TV Service, we do all the work for you! Located out of Baton Rouge, Louisiana, our business has served Baton Rouge and the surrounding area for over 30 years. Simply call and we will send a licensed technician to inspect, diagnose, and repair your television, all within the comfort of your own home. We work on every popular brand and many different varieties of televisions, including projection, HDTV, LCD, LED, and many more! For a complete list of supported brands and models, visit our brands page. With our technician in your home, you can be sure you are receiving the BEST service at a BARGAIN price. With in-home repair, you don't have to fear additional damage to your television through transit to a repair shop or the negligence of a shop repairman. You will stay informed, as our technician will provide a detailed explanation of your television's issue as he repairs it. Don't overwork yourself! At Affordable In-Home TV Service, you can relax... we come to you! We work primarily within the Baton Rouge area and some surrounding cities. We also will come out to Walker, Zachary, Prairieville, Port Allen, Brusly, and Addis. For estimates on the cost of service in your area, give us a call at (225) 262-4472. AKAI, Denon, Emerson, GE, Harmon, Kardon, Hitachi, JVC, LG, Magnavox, Mitsubishi, Philips, Panasonic, Pioneer, Polaroid, Quasar, RCA, Samsung, Sharp, Sony, Sylvania, Teac, Toshiba, Vizio, Westinghouse, Zenith, and many more. We specialize in Big Screen TV, HDTV, Projection TV, DLP TV, LCD TV, LED TV, and VCR repair. If you any question as to what type of television you have, we will assist you over the phone. 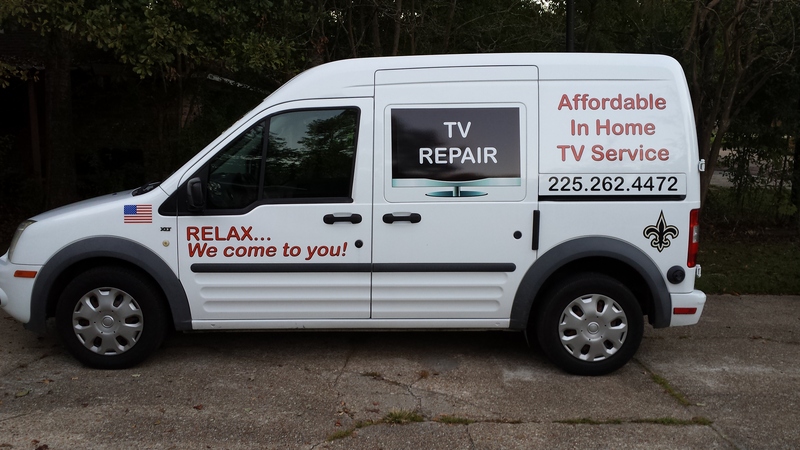 Affordable In-Home TV Service, LLC has been serving South Louisiana since 1984. Our technician is a proud member of NESDA (National Electronic Service Dealers Association) and SESDA (South Eastern Service Dealers Association). He is factory trained and possesses an LA Radio and TV License as well as an F.C.C. License. © 2016 Affordable In-Home TV Service, LLC. All Rights Reserved.